This is an example of what I mean by “historic interpreter.” A historic interpreter usually dresses in period attire and communicates with learners as a person from the past (known as “first person interpretation,” or as a contemporary person speaking about the past “third person interpretation.” Not all interpreters don historical drag and work it like its 1799, but some, like me, the few, the proud, the crazy as hell will because the total effect counts. To most people the history of enslaved Africans is envisioned in woodcuts, splintered images from a splintered and shameful past, cartoons and mockeries. 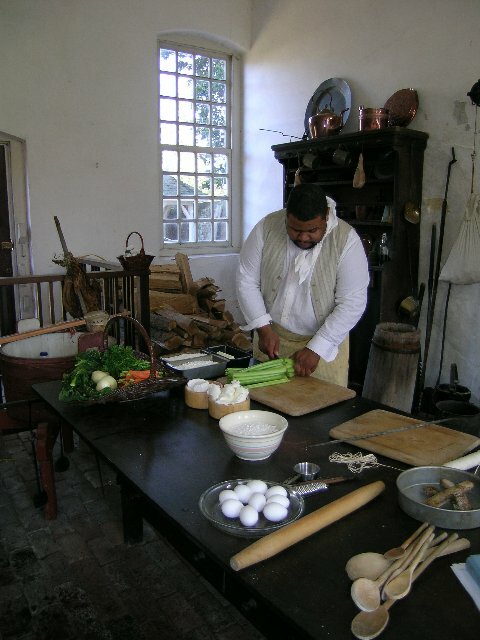 I have no choice but to go beyond technicolor and head straight for Reality TV so young people today can really see, smell, taste, hear, feel, slavery and its legacy Here, I’m preparing a Christmas feast at Stratford Hall Plantation, the birthplace of Robert E. Lee. 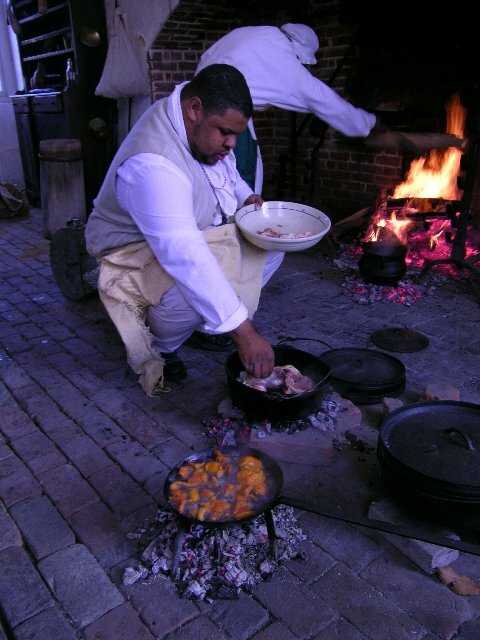 There aren’t too many of us who are willing to “go there.” As a history buff and proud African American I found it exhausting hearing about the anonymous culinary gifted Black “slaves” who from Boston to Bahia changed the way the world ate. I knew I had to embody these ancestors and their lives so that people in our present time could put a face on the individuals formally dismissed as “Aunt,” “Uncle,” “Mammy,” and the like. I have picked cotton, worked tobacco, gone into water moccasin and alligator infested rice fields and tasseled corn all in the hopes of understanding our culinary past and the context it was created in. So this is a food meets history blog–wanna know the menu? Field Peas, Cymling Squash, Collards and Cornmeal Dumplings, Spareribs, Hoecake, Pigs Trotters, and pretty much a little bit of everything in category one….hey if you’re the cook you sneak a little bit of everything to the Quarters, especially while everybody in the Great House is tipsy.